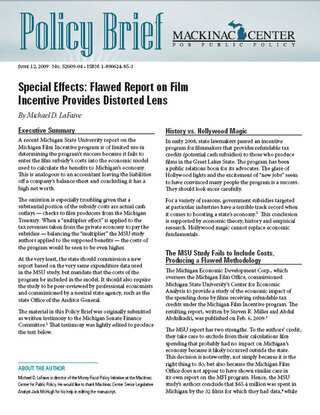 A recent Michigan State University report on the Michigan Film Incentive program is of limited use in determining the program's success because it fails to enter the film subsidy's costs into the economic model used to calculate the benefits to Michigan's economy. This is analogous to an accountant leaving the liabilities off a company's balance sheet and concluding it has a high net worth. The omission is especially troubling given that a substantial portion of the subsidy costs are actual cash outlays — checks to film producers from the Michigan Treasury. When a "multiplier effect" is applied to the tax revenues taken from the private economy to pay the subsidies — balancing the "multiplier" the MSU study authors applied to the supposed benefits — the costs of the program would be seen to be even higher. At the very least, the state should commission a new report based on the very same expenditure data used in the MSU study, but mandate that the costs of the program be included in the model. It should also require the study to be peer-reviewed by professional economists and commissioned by a neutral state agency, such as the state Office of the Auditor General. The material in this Policy Brief was originally submitted as written testimony to the Michigan Senate Finance Committee. That testimony was lightly edited to produce the text below.